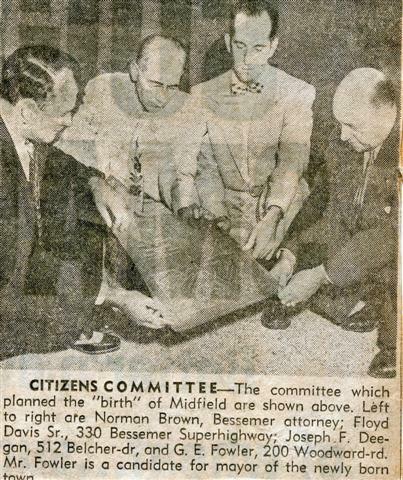 “The Midfield community started in the late 1920s by Alandale Land Company, with paved streets and sidewalks. Lots went up for sale. By the late 1940s, there were only three houses. Belcher Lumber Company purchased the balance of the property and started building houses, and by 1950 there were several hundred houses. Dobbs bought the property south of Woodward Rd. and built several houses. “It was a growing community without a school and the parents wanted to keep their children close to home. So the Midfield Civitan Club appointed a committee to get a school built in the community. The committee, consisting of W.H. McGibbony, N.B. Breland, W.A. Jordon, and Floyd Davis Sr. as chairman, checked with Birmingham and Fairfield to see if they would build a school in the community if the community voted to come into either one of the cities. Both sides said no. The committee worked with Jefferson County and the County said it was too close to Fairfield and Birmingham. The community could be taken in by legislation, so the committee contacted the State Legislature. They sent a letter that they would not legislate the community into either city during their term. The committee gave the county the letter and the county told the committee to try to get the first grade started in one of the churches. The committee got the Presbyterian Church to let the committee use one of the sunday school rooms for the county to use for the first grade. The first grade started in the fall of 1952. “The committee continued to work with W.A. Belcher and George Gibbins, landowners, and got the landowners to sell the Jefferson County Board of Education 11 1/2 acres to build an elementary school. In May of 1953, the county board of education bought the property and plans for the present Midfield Elementary School started. The committee continued to work with the county board of education. “Fairfield Mayor J.T. McLaughlin called Floyd Davis Sr. and asked him to come to his office. On arrival, the Mayor, the City Clerk, W.F. Poer, and several members of the Fairfield City Council were present. The Mayor asked Davis if he would go back to Midfield and prepare the people that the Fairfield City Council, at their next meeting, would adopt a resolution asking the Probate Judge to call for an election asking the people of Midfield to vote to come into Fairfield. Davis asked them to back off, for the people of Midfield would continue to support the County Board of Education’s investment in buying the property and starting a school. Fairfield still wanted to call the election, so Davis told them he would go back to Midfield and prepare the people, but it wouldn’t be to their liking. Contractors completed the school building and in September of 1954 Midfield Elementary School opened its doors with six teachers and grades one through six. Additions were added to the building in 1955, 57, 61, and 76 and the four kindergarten rooms were added in 1979. The first Midfield City Budget was around $15,000.